Today's Daily Deal! Save 64% on the Women's In Transit Half Zip Now Only $24.99 + $1 Shipping with code DOLLARSHIP at JoesNewBalanceOutlet.com! Offer valid Wednesday, 1/3. Shirring gives this versatile layer a little va-voom. 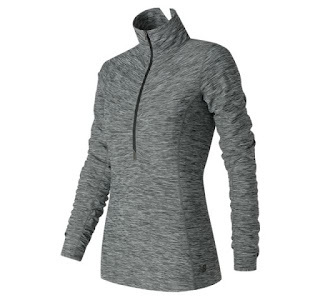 A workout workhorse, we made sure this women's pullover has it all: zip media pocket, thumbhole cuffs and soft, wicking NB Dry fabric. We even included a little notch in the back of the face-framing collar to enhance freedom of movement.